Jena Kingsley is the latest in a series of comedians to poke fun at social networking systems by forcefully interacting with people in public places and proving that our online lives are silly when taken literally. Facebook has a little-used function called a poke. Nobody truly knows how to define a poke, some thinking it is sexual and others thinking it is playful fun; but I can press a poke button and you, whether or not we’re friends, will get a notification you were poked. You can then ignore it or poke me back. Or poke anyone else. But if I walk up to you on a sidewalk and poke you, how do you react? Twitter enables people to “follow” you but if I randomly started following you in real life, you’d think that’s weird, right? These and other companies created internet lingo that we employ whenever we use their systems but the lingo only makes sense on their systems. The lingo and the descriptive language, such as friends on Facebook vs connections on LinkedIn, frustrates my students when I explain the basics of social media. Try to live your life around the lingo and everyone around you will think you’re crazy. Can Oracle Be More Boring? Oracle Corporation is launching a new social network — called the Oracle Public Cloud — geared to business departments to share and collaborate. It’s scheduled to arrive in 2012. But can they create a more boring video? By contrast, Google Inc. created a more attractive video about their Google+ social network that launched earlier this year. It’s filled with faces and names and screenshots of the drag-and-drop technology that millions use today. Thirty seconds into the Oracle video, I yawned out of boredom and read the more entertaining YouTube comments about it. You? If you can’t see the above videos, here are YouTube links to Oracle’s and to Google’s. The beauty of flash mobs is when people come together in public places to entertain others. It’s usually the creative juices of theater company and dance studio executives to galvanize their troops and put on a 5-minute show set to music. Train stations and outdoor plazas are typical locales of flash mobs due to their vast performance spaces and pedestrian-friendly hubs. Participants tell their friends to join expected tourists, and everyone has a good time. It’s rare thousands of residents participate and rarer a city’s downtown on a Sunday afternoon is the backdrop. But what happened in Grand Rapids, Michigan in January 2011 was the exception. See, the city of 188,000 was ranked by MainStreet, an internet publication, as one of 10 cities nationwide with a declining population between 2000 and 2010 and a further shrinking of residents under age 18. 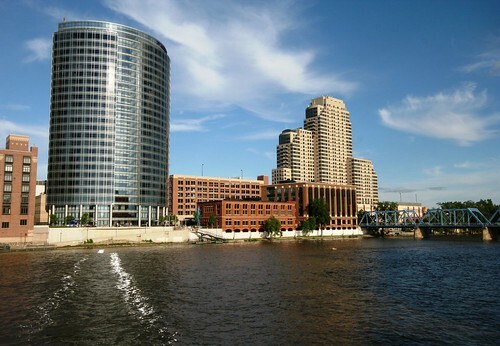 Based on those two data points alone, Grand Rapids made MainStreet’s list and the article was picked up by Newsweek. The city reacted in the form of a lip dub to the tune of Don McLean’s “American Pie” and Roger Ebert joined 3.9 million YouTube viewers to praise the greatest music video ever made. The video reeks of awesomeness. Profiled by ABC News, the mayor is one of the featured singing guitar players. Nearly 5,000 volunteers fill the 9-minute video, ranging from police officers and firefighters to marching bands, motorcades, pillow-fighting kids, wedding guests, and a helicopter. It’s impressive $40,000 were raised by donations — inspired by the MainStreet/Newsweek list. The city didn’t spend a dime and nobody advertised the event; after all, the media were among those donating. MainStreet later explained its methodology and Newsweek apologized; but nobody cared at that point. The video went viral and we recognized the city was not dead. Hat tip to Jamie Bradley of Sophwell for the find. This is written by Charles Sipe. He is the executive editor at Criminal Justice Degree Schools. The recent documentary Waiting for Superman paints a bleak picture of the US education system that is falling behind other developed countries and failing to provide the high skilled workers that are needed to drive innovation and compete with the rest of the world. According to the film, by 2020, 123 million US jobs will be high skill, high pay, but only 50 million Americans will be qualified to fill them. Despite the many problems with US education, there are some bright spots such as the man Fortune magazine called Bill Gates’ favorite teacher. Salman Khan quit his high paying finance job to start making YouTube videos from his closet that teach students everything from 1 + 1 to advanced calculus and college-level science. What started out as a way to tutor his cousin, has grown into a collection of over 2,100 short videos at KhanAcademy.org that have been viewed over 40 million times. With a mission of providing “a free world-class education for anyone anywhere,” Khan has reminded us that we can solve seemingly impossible challenges. What lessons can we learn from Khan’s remarkable story? Instead of the traditional teaching method of one teacher lecturing 20-30 students at a time, Khan promotes assigning his comprehensive video lectures as homework so that students can work on exercises in the classroom and get help from the teacher. This approach allows students to work at their own pace while allowing teachers to help students when they need clarification or assistance in understanding important concepts instead of struggling to figure it out on their own. What areas of status quo in your work or life can be flipped upside down to reveal new and potentially better ways of doing things? Gaming, especially social gaming, is a rapidly growing media that engages a huge audience. You probably know a person who is so addicted to Farmville that they will go out of their way to make sure that they harvest their plants. While managing virtual farms may seem trivial, it is evident that game mechanics can be a tremendous motivator and can be highly effective in encouraging a specific desired behavior. Salman Khan is currently using game mechanics to increase student engagement and motivation by awarding badges for specific accomplishments. The addictive nature of earning achievements or earning points to climb the ranks against your peers can be a powerful method for encouraging positive action such as studying math or getting customers to participate in an online community. The videos that Khan creates are by no means flashy or incredibly entertaining. They are as minimalist as can be with a simple blackboard application and Khan providing the voiceover (you never see his face in the lessons). However, the medium itself can be an extremely engaging way to communicate a message. When we watch the videos we almost feel like Khan is in our head, explaining how to solve complex equations or understand mitosis. Video is also easier to consume than reading, since watching a video tends to be a more passive activity. Despite requiring less mental focus, the combination of audio and video can be highly memorable, which has helped countless students perform better in school. The main point here is that it is the substance of the content that has earned Khan over 40 million YouTube views, not the style. How does one person teach millions of students when teachers often struggle to manage a class of 30 kids? The Internet offers the most effective tool ever to help an individual or small group scale to provide a service for a huge audience. Khan demonstrated this by teaching millions of students from his walk-in closet with some simple video creation tools. By following the example of Salman Khan, you can create a product or service that can be efficiently scaled to reach a huge audience through free tools like YouTube. Instead of running a small physical shop where you live, you can sell to millions of potential customers from anywhere in the world by using inexpensive tools like online store creator Shopify. Salman Khan’s story provides a good example of how the Internet can help scale the work of one person to achieve huge results.